Rods: Steve has been affiliated with St. Croix since 1988 and has found no reason to use any other brand. St. Croix has five levels of musky rods — the Legend Elite, Legend Tournament, Premier, Mojo and Triumph series. Steve has tried all of them but prefers the Legend Elite and Legend Tournament series. “Both top-of-the-line series have three St. Croix proprietary features — IPC (Integrated Polycurve Technology), which allows for smoother casting and greater sensitivity; ART (Advanced Reinforcing Technology), which strengthens critical stress points without adding bulk or weight; and FRS (Fortified Resin System), which creates a blank that is 33 percent stronger,” said Steve. “In addition, the Legend Elite series offers TET (Taper Enhancement Technology) which provides curved patterns for improved action with increased sensitivity. For more on ART, IPC, FRS and TET, click here. “Figure-8’s are extremely important with twin-ten bucktails and these rods make the maneuver more efficient,” Steve said. Other good bucktail sticks from St. Croix, though less expensive, are the 8-0 Premier (PM80MHF) and the 8-6 Premier (PM86HF), and the 8-0 and 8-6 Musky Mojo (MM80MHF and MM86HF). Jerkbaits — For glider-style jerkbaits (e.g. Reef Hawgs, Hellhounds), Steve uses the St. Croix 7-6 Legend Elite (LEM76XHF) or Legend Tournament heavy action rod (LTM76XHF) “The Jerk.” For diver-style jerkbaits (think Suicks), he uses St. Croix’s Legend Elite St. Croix 8-6 Legend Elite (LEM86HF) or Legend Tournament 8-6 heavy action (LTM86HF) “Sling Blade.” Lower-priced alternatives include the 7-6 Premier (PM76HF), the 8-6 Premier (PM86HF) or the 7-6 Musky Mojo (MM76HF). Crankbaits and minnowbaits — For large crankbaits and minnowbaits (DepthRaiders, Triple D’s, 10-inch Slammers, 10-inch Jakes, etc. ), Steve uses St. Croix’s Legend Elite 8-6 (LEM86HF) or 8-6 Legend Tournament (LTM86HF) “Sling Blade.” For smaller crankbaits and minnowbaits (Baby DepthRaiders, 6- to 8-inch minnnowbaits, etc.) he uses St. Croix’s Legend Elite (LEM86MHF) or Legend Tournament 8-6 medium heavy (LTM86MHF) “Long Ranger.” Less-expensive alternatives are the medium heavy 8-6 Premier (PM86MHF) or the 8-0 Musky Mojo (MM80HF). Topwaters — For prop baits, Steve uses St. Croix’s 8-6 Legend Elite (LEM86MHF) or Legend Tournament 8-6 medium-heavy action (LTM86MHF) “Long Ranger.” For walk-the-dog topwaters (Jackpots, Weagles) he uses the 7-6 Legend Elite (LEM86XHF) or Legend Tournament “The Jerk” (LTM76XHF). In other series, you’ll want the 8-6 Premier (PM86MHF) or 8-0 Musky Mojo (MM80HF) for prop baits, and the 7-6 Premier (PM76HF) or 7-6 Mojo (MM76HF) for walk-the-dogs. Soft plastics — Steve uses St. Croix’s Legend Elite (LEM90XHF) or Legend Tournament 8-6 Legend Tournament “Big Dawg” (LTM86XHF) or 9-0 Big Nasty (LTM90HF). In the Premier series, you’ll want the 8-6 (PM86XHF), and in the Mojo series you’ll want the 8-0 (MM80HF) or 8-6 (MM86XHF). Livebait, trolling — St. Croix Premier 8-0 (PG80HM). This rod features fiberglass construction for increased durability in extreme conditions. To read Steve’s review of St. Croix’s new Legend Elite series, click here. Reels: Steve has long been a big fan of the St. Croix AC-300A, which is an extremely smooth reel with terrific durability, outstanding drag, and a versatile 5.1:1 retrieve ratio. However, this reel has been phased out by St. Croix. Good reels that Steve has personally used and suggests are the Shimano Tranx series, Shimano Conquest, Abu Garcia Revo Toro series, and Daiwa Luna 300. Lures: Steve believes that lures are tools, and there are no magic baits. Each one is used for a specific situation. His tackle box is filled with lures like Mepps, Double Cowgirls, DepthRaiders, Slammers, Reef Hawgs, TopRaiders, Teasertails, Grandmas, Jakes, Stompers, Bull Dawgs, Shallow Invaders, Jackpots, and Triple D’s, to name a few. Steve highly recommends the Mepps line of bucktails. In fact, he helped design the Mepps H210, Musky Flashabou, and the Giant Killer Sassy Shad. Of course, he also uses the Musky Killer, Magnum Musky Killer, Giant Killer, Musky Marabou, Double Bladed Musky Marabou, and Marabou lines. No other company offers Mepps variety of colors, as well as the mix-and-match versatility of switching blades and tails right in the boat. 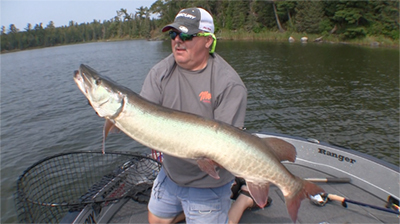 Plus, the split-ring-jointed design provides a more life-like tail action as the lure is pulled through the water, helps these baits cast like a bullet (rather than “helicopter” in the wind), and helps prevent muskies from throwing them during the fight. Steve often uses Mister Twister tails to add color and vibration to many of his bucktail offerings. Trolling Motor: Steve has long been a fan of Minn Kota’s Terrova and PowerDrive models, and starting in 2017 uses a 112-pound thrust, 36-volt self-deploying Ulterra. Not only do these trolling motors have plenty of power, but they have unsurpassed durability. With an 18-foot cable to the control pad as well as Minn Kota’s I-Pilot, the trolling motor can be steered from anywhere in the boat! “I-Pilot is awesome. Say you’ve just fished a rocky, complex shoreline and spotted a giant fish you’d like to come back and fish later. Certainly fishing at first-dark is one of your best chances at catching that fish. Since I-Pilot records your GPS track, you need to simply save the track. Then, when you come back and maybe visibility isn’t so good or it’s completely dark, just let I-Pilot steer your boat to that monster,” Steve says. Outboard: Steve has never used anything but Mercury Outboards and rigs his Rangers with either Verado 225 hp or OptiMax 225 hp Pro XS high performance engines, and 9.9-horsepower Mercury Pro Kickers. Steve couples his Verados and Pro XS with a Mercury high-performance stainless steel props. Boat: Steve has been a member of the Ranger Boats family since 1995. He fishes out of Ranger’s new 619FS Fisherman. 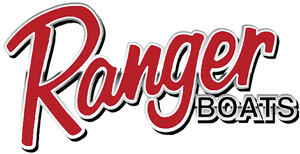 For more information on Ranger boats, visit: www.rangerboats.com. Boat, Outboard Dealer: Shoeder’s Marine in Rhinelander is Wisconsin’s northwoods Ranger dealer, and is where Steve Heiting orders his Ranger/Mercury rigs. Fishfinder/GPS: Steve has become a big fan of the new Humminbird fishfinder/GPS combos, and now uses Humminbird’s Helix 10 units front and back. “Humminbirds have great resolution, tremendous target separation, and unmatched GPS accuracy,” Steve noted. The Helix units have Humminbird’s exciting Side Imaging and Down Imaging technology. Leaders: Steve uses fluorocarbon leaders made by Stealth Tackle about 80 percent of the time. He uses a solid wire leader when trying to get more swing from a glider jerkbait or walk-the-dog topwater, and during the spring, when he will choose one of Stealth’s lightweight wire leaders, which Steve helped design. Stealth leaders are tied, crimped and glued, so they aren’t going to fail, and are coupled with a 150-pound test stainless steel ball bearing swivel and Stay-Lok snap. The Stealth fluorocarbon leaders Steve uses are made with 130-pound test fluorocarbon and measure 14 inches long. His solid wire leaders are made by Stealth and feature 174-pound test American Fishing Wire material. 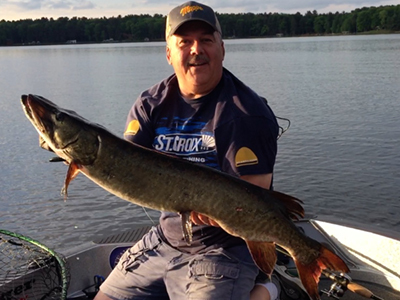 “I’ve used Stealth leaders since the 2008 season and have had countless big muskies get the leader in their teeth, yet I have not lost a single fish to a bit-through leader. 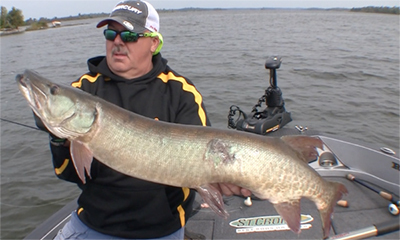 The 130-pound test size seems perfect for handling musky teeth. 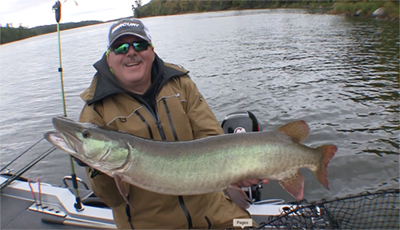 I know, because of the near-invisibility of fluorocarbon, I catch more and bigger muskies with Stealth leaders,” Steve said.